Several organizations collaborated on the artist-in-residence program. ArtPlace America is providing a $125,000 grant for the program, including a $40,000 stipend for the selected artist and $25,000 for a final project(s) the artist and staff develop. Transportation for America (T4A) will administer both the funds and the overall program, including providing staff and consulting assistance. The State Smart Transportation Initiative (SSTI) will also provide staff support. Both T4A and SSTI are programs of Smart Growth America. 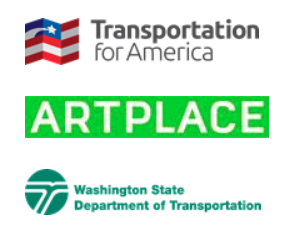 WSDOT will supply in-kind contributions consisting of work space for the selected artist and staff time for agency workers to collaborate on the groundbreaking new program. “Artists can provide fresh approaches and new ways of doing things, interpret complex processes, and provide unique perspectives for existing programs,” said Ben Stone, Smart Growth America’s director of arts and culture.